Given Adaptive’s extensive experience with automated test & inspection, packaging, material handling, direct part marking, and labeling, Adaptive is a clear choice for complete end of line product handling solutions. Routinely integrating systems that incorporate nearly all end of process functions, there are few other integrators that that can deliver systems with the magnitude and overall capabilities as those delivered by Adaptive. Ranging from complex traffic management, to inline buffering, to high speed packaging, to systems designed for 24/7 operation, Adaptive is the partner of choice for EOL packaging systems. Lean on Adaptive’s knowledge and aptitude to select the correct equipment and develop the lean flow you require to achieve your EOL objectives. A subset of Adaptive’s end of line packaging knowledge is the process of case erecting, case loading, case sealing, and labeling. Adaptive routinely integrates off the shelf case erectors and case closers with custom machines and robotics for complete case loading solutions. Developing standard and high speed systems, solutions ranging from simple to comprehensive, Adaptive has the knowledge and experience to solve all of your packaging challenges. Adaptive also has experience implementing shrink wrap systems into its end of line packaging solutions. We have implemented both individual component shrink wrappers and shrink bundling machines. We have used state of the art zero edge shrink wrappers, as well as standard shrink wrap technology. Our solutions consider run time, changeover, accessibility, maintenance, and much more. Partner with Adaptive for all of your packaging automation needs! 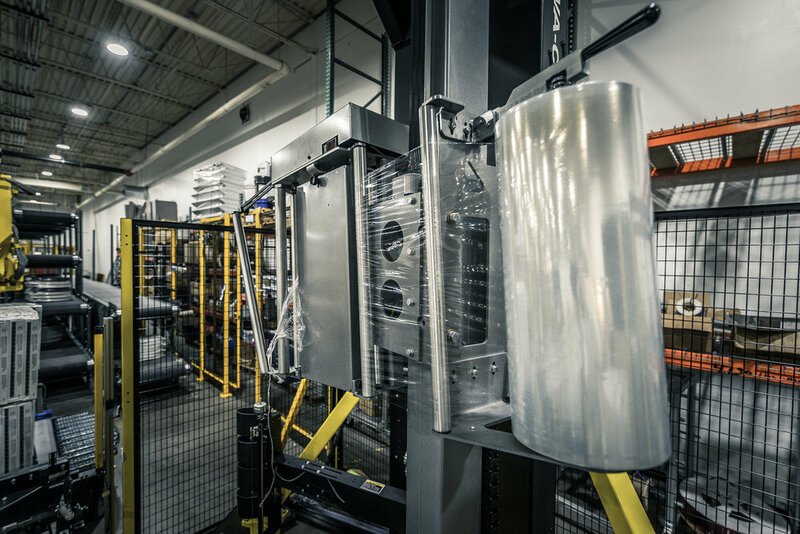 Palletizing is a primary component of Adaptive’s end of line packaging knowledge. Having implemented both gantry and robotic arm solutions, you can count on Adaptive to select the best and most appropriate equipment for your application. Adaptive has experience palletizing by individual container, row palletizing, and by full pallet layers. Adaptive also has experience with SKU sorting for palletizing, necessary when multiple products are coming to a single palletizing area simultaneously. In many cases, Adaptive’s unique approach to SKU sorting has allowed handling of a much greater number of SKU’s without the added cost of multiple palletizing cells. 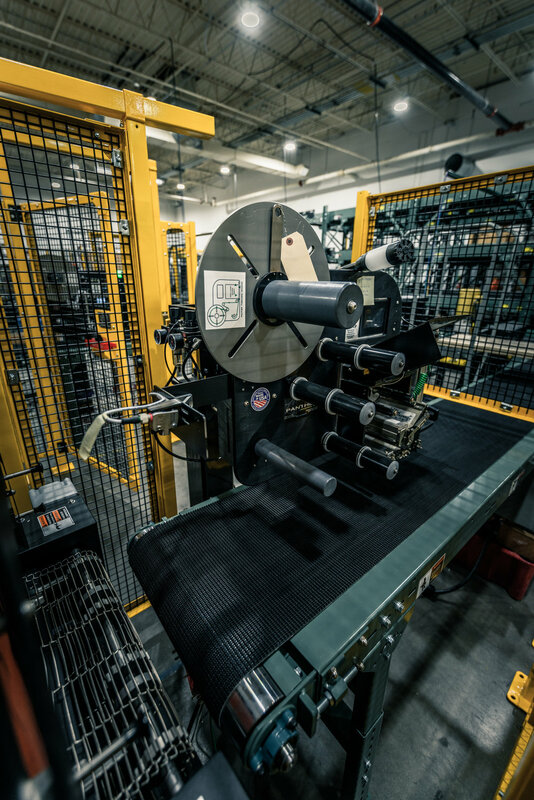 Frequently, our palletizing cells are linked directly to a stretch wrapping machine delivering completely loaded and wrapped pallets to a specified unload point. Come to Adaptive with your packaging challenges and quickly learn the difference in working with us! Print and apply labeling machines, ink marking systems, laser marking systems, and dot peen systems are technologies Adaptive uses and implements frequently. There are many factors that should be considered when selecting marking technology, and Adaptive has been through this decision process on many occasions. Even after a process decision has been made, there are many choices in brands, types, and performance with each of the different technologies described above. Print & apply label applicators for example, come in many different configurations, form factors, and performance levels. Partnering with a company like Adaptive can help avoid costly mistakes, insure selection of the appropriate equipment, and deliver a reliable, effective process.